Yesterday I posted a video interview of Peter Thiel. He’s the Internet investor who is paying 20 college age people $200,000 to leave college for two years. He’s trying to show that you don’t need a college education to be a success. Well, first of all I agree with his premise. Many people without a college education are a success. Even so, it’s interesting to see what these 20 people are doing. The vast majority of them have started small businesses. A few are writing books. I don’t think any of them are working for major companies right now. The reason why is enlightening. You see, businesses use a college degree as a signaling mechanism. By finishing college, you get that credential which indicates to the business you are worthy of looking at. Because of this, most companies have reduced HR departments. Essentially they have outsourced some of the job of finding employees to the university system. I think this relationship is what is keeping universities in demand. I wrote about this last year. If You Give it Away for Free, Is it Worth Anything? Students know they can’t get into certain fields without a degree, even if they know a lot about the field. With the vast amount of material on the Internet, we are raising a new generation of young people who will have more diverse skills but still have to have that credential. So what if this changes? What if somebody came up with a better way to evaluate and credential people? What if we were able to credential someone based on what they actually know, and not where they went to school? Wouldn’t you get a much better picture of a potential employee’s value? As more and more of our world gets automated, many industries need fewer and fewer people. Therefore the quality of those people will be more important than in the past. Businesses will have to have a way of finding these people. Just picking everyone with a graduate degree might not tell you enough. Ironically, the more people who go to college, the large the pool of graduates. This works if the labor market is expanding at the same rate but right now it’s shrinking. The larger the graduate pool, the less useful it is as a signaling mechanism. Colleges are diluting the value of their degrees by handing out more of them. Make no mistake, the reason most students go to college is to get a good job afterwards and they know a degree is the ticket to open that door. Try this experiment: Tell a student you will guarantee they will learn a lot about their subject but you also will guarantee them they WON’T get a job afterwards. I think nobody would show up. Instead, they would go camp out in a park in Wall Street. 🙂 Football, dorms, research, deans, buildings, donors, faculty, fraternities; everything is resting on this one fact. 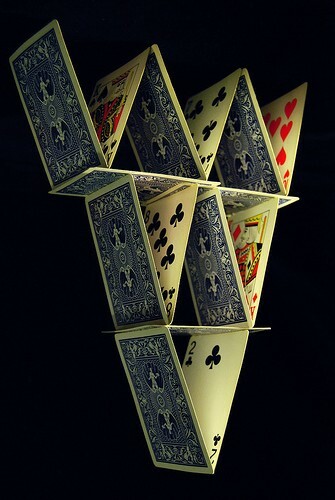 It’s an inverted house of cards. If you take that one card out, the whole system will collapse. If another, much cheaper, more effective way to get that access to the business world is developed, people will use it. Not many at first, but it will happen. This is the disruptive innovation I’m watching for. This is what Peter Thiel is going after. Just remember, just because students showed up this semester, doesn’t mean they will show up next semester. Of course I could be wrong. Please let me know what you think in the comments! I love a good discussion! Businesses don’t just hire college graduates for what they know. Yes, some sort of authentication of knowledge could probably sometimes be substituted. But some business owners whom I know hire college grads because of what it says about their work ethic, that they are able to do things that are hard and not give up and that they will finish what they started. Those folks hire grads for positions that don’t really need a degree necessarily, but they want to know what kind of worker the person is. Hi davisphd, What you wrote is based on first hand experience and I really thank you for contributing to the discussion! I would assume then you are a person who greatly values a credential based system. So here’s a hypothetical. If you didn’t have a phd but still had that body of work, should someone hire you or just hire a phd fresh out of school instead? Very interesting article. I agree that the value of a degree is diminishing. More students are graduating with a piece of paper and a mountain of debt. Interesting video! I think this view will become more prevalent in the coming years as people realize there is more than one way to do things besides college.